AUDREY HORNE might be a phenomenon. Imagine a band with black metal pedigree that plays hard rock with catchy refrains, have done so on three albums previously and actually took their name from one of the female characters in Twin Peaks!? Well this is what you get when you listen to AUDREY HORNE. 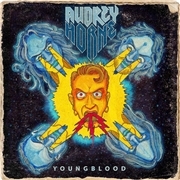 But…admit it, even the cover has more than a fair share of death metal (a cartoon of Dismember´s classic EP “Pieces”?). Opener “Redemption Blues” has a lot of finesse, force and 80-ies DNA. The sheer NWOBHM rifferama of “Straight into Your Grave” and MOTÖRHEAD intensity is only hampered by a slightly less developed refrain. The cozy title track is also close but the full hit comes with “There Goes a Lady”, a contagious song with a pinch of Hammond and a fabulous riff. The must be heavily influenced by the English wave of the early eighties, and of cause the perennials like MOTÖRHEAD and UFO, the latter as in the slightly less inspired “Pretty Little Sunshine”. The entire album is as a whole not up to 5/5, but the feel-good, the intensity, the grooves and the sheer surprise of former raccoon make-ups producing high octane hard rock is mind-blowing.